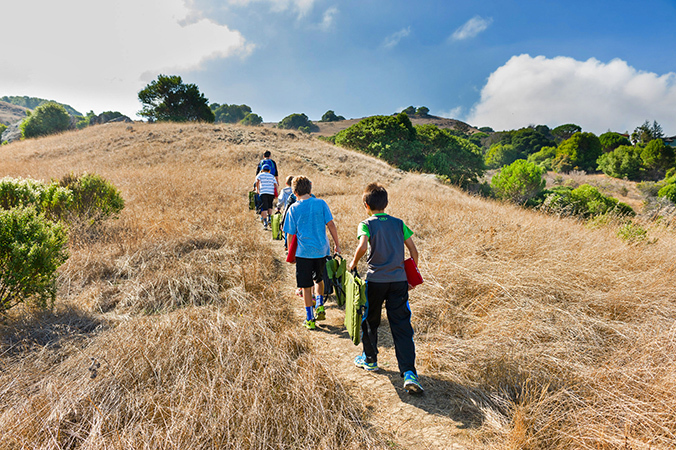 Thank you for considering Marin Country Day School for your family. Our admission season for the 2019-20 school year is now closed. The application deadline was January 14, 2019. For those interested in the 2020-21 school year, the next admission season will begin in September 2019. Please read on for more information on the application process. Tours are held on select mornings from October to January. Tour dates are announced every September. Please plan to tour before submitting an application. Families are not required to tour again if reapplying for the same child. Reservation required, adult only event. If you require special accommodations or a translator, please contact us at admission@mcds.org. If relocating outside the standard admission season, a tour can be arranged. After a campus tour, prospective families will continue the application process online. Ready to apply? We will begin accepting applications for the 2020-21 school year in September 2019. Applications and supporting documents were due January 14, 2019. Applications were due October 19, 2018 for MCDS siblings, faculty and staff applying to kindergarten. Applications for indexed tuition were due January 14, 2019. To learn more about our affordability model, indexed tuition, click here. Application fee is $100, is payable online by credit card, and goes toward the cost of assessing applicants. If you require a fee waiver, please contact Kara Diaz at kdiaz@mcds.org. After a tour and once an online admission account has been created, a thirty minute parent interview may be scheduled with a member of our admission team. Self-scheduling is available on the homepage of the family admission portal. Parent interviews are an opportunity to meet a team member in person and engage inan informal exchange. Only one interview is needed per family; any/all parents or guardians are expected to attend. Applicants are required to attend an on-campus group screening to assess developmental and social readiness. Screenings are held on select mornings and will be scheduled by the admission team once the child's application is processed. Sibling applicants interested in the 2020-21 school year will be screened on or before 11/9/19. New family applicants will be invited to screen between December 2019 and February 2020. Applicants are invited to campus between October and February for a classroom shadow visit on a normal school day. These visits occur on select mornings from 8 am to 11:15 am for applicants to grades 1-4 Visits will be scheduled with the admission office once the child's application is processed. Visits: Applicants are invited to campus between October and February for a classroom shadow visit on a normal school day. These visits occur on select mornings from 8 am to 11:15 am for applicants to fifth and 8 am -1:20 pm for those applying to sixth and seventh. Visits will be scheduled with the admission office once the child's application is processed. Standardized Testing: SSAT or ISEE are standardized admission tests and we require applicants to grades 5-7 to take either one at any convenient and public test site before Feb 1, 2019. Click here to register for the ISEE using school code 054004 OR click here to register for the SSAT. Please be sure to have the test center of your choice share results with MCDS directly. MCDS hosted the ISEE on Saturday, January 26, 2019 for MCDS applicants (invitation code 9VYQ8JY7). Sixth Grade Admission Saturday: Admission Day for those applying to sixth grade was on Saturday, February 2, 2019. Sixth grade applicants visit campus, meet teachers, and participate in fun activity sessions as a way to assess readiness for the MCDS program. Please save the date and RSVP by emailing Zoe Davis (zdavis@mcds.org). After the admission checklist has been completed, apps have been processed, and assessment results have been gathered, the Admission Committee will mail notifications on March 20, 2019 and post them online via admission portals on March 21, 2019. Families will have until 10 a.m. on March 28 to accept or deny admission offers. Tuition determinations will be available online on March 21. If you need to discuss your tuition offer between March 21 and March 28, please contact Kara Diaz, Associate Director of Admission and Indexed Tuition, directly. Traditional entry points for admission are kindergarten and sixth grade. Admission to all other grades is based upon attrition, and therefore difficult to predict if and when spaces may become available. We encourage you to apply if you feel MCDS would be a good fit for your child and family; should space become available we admit students from the current applicant pool. Children who are not age five by August 1 in the year they would enroll are not encouraged to apply; however there is not an absolute cut-off date. We have a developmental program that is appropriate for a range of children and waiting an extra year is not necessarily an automatic benefit. As students move from fifth to sixth grade, the program shifts from self-contained classrooms to a departmental structure and grade-level advisor groups. This format allows us to admit approximately twenty new students, expanding the size of the grade which broadens the social dynamic of the class. We do not accept applications to eighth grade.